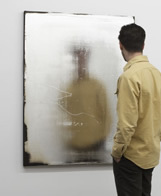 See also: Jacob Kassay's maximised minimalism - an overview of his work to date, from minimalist-inflected silver canvases to Arte Povera jute sandbags - and an analysis of just what it is that makes this young American artist such a hugely promising newcomer. Born in 1984, New York native Kassay has spent the last couple of years producing promising abstract works which demonstrate a concern with process and concept alongside increasingly minimal appearance. The piece shown below left, for example, takes the traditional starting point of a painting - the first strokes of a layer of gesso - and turns it into a finished work through sanding and scarring of the gessoed centre. Kassay's most exciting development, however, is a recent foray into silver-plating which was debuted at his first solo show (page top and above, right). Preparing his canvases with loosely applied, broad strokes of colour, the work is then chemically plated. 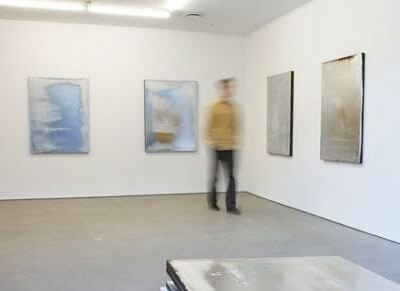 The resulting mirror-like planes reveal the ghostly presence of the underpainting as surface irregularities, pock-marked occasionally with tiny patches of colour. 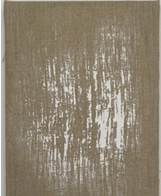 In addition, any exposed canvas is scorched by the plating process, resulting in dark, smoky edges to the metallic surfaces. Part sculpture, part painting, these bravura works play with the idea of reflection and revelation in obvious, though none the less satisfying ways. There's also, of course, a reference to photography - capturer of reflections par excelence - in Kassay's nod to the silver coated plates commonly used in the 19th century. It's early days for Kassay, of course, and it will certainly be interesting to see how (and if) he develops his work. Nevertheless, we're betting that his name will be popping up everywhere in 2010, so tracking his progress shouldn't be a problem.